What is a Dental Cap? Home/Blog/What is a Dental Cap? One of the most common questions patients ask at Smiles of La Mesa is “What is a dental cap?” A dental cap, also called a crown, is typically constructed from porcelain and placed on top of a tooth for a variety of reasons. Ceramic and metal also make attractive options, although they may not be as durable. A cap is a permanent dental prosthetic that remains in place indefinitely or until you request to have it removed. When you practice good oral hygiene and don’t put undue stress on the cap, it can last for more than a decade before needing to be replaced. Who Might Need a Dental Cap? When you decide to get a dental cap, the first step is to prepare the tooth to receive it. 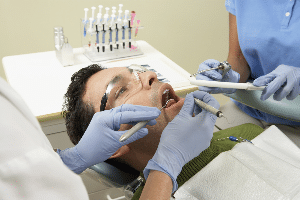 This involves the use of a dental drill to reduce all of the surfaces of the tooth. The next step is to for us to take an impression of the tooth with a dental mold. Once that is complete, we send the mold to our laboratory for a technician to create your new dental cap. When it comes back from the laboratory, you need to come in for a second appointment. During this session, Dr. Gonavarum cements the new crown to your tooth and allows time for it to harden to ensure it will remain in place. The cap completely covers the surface of the tooth and ends just above your gum line. The result is a smile that you will be proud to display at any time.